Happy Bloggers Challenge Friday! Thanks to those who played along with the Easter Challenge last week. The challenge this week is Alter It. 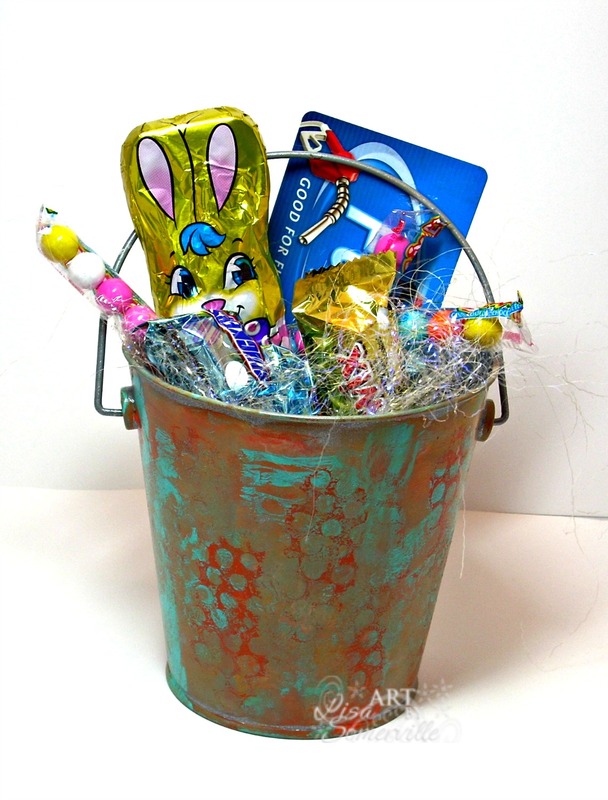 Needing a basket for Easter goodies, I dug into my alterable stash of products and found some plain silver pails that I bought from Target some time ago. I gave them a facelift using the Gelli Plate, DecoArt American Multi-Surface Satin Acrylic Paint, Punchanella and a stencil from Just a Trace. Thanks for stopping by, have a great weekend and a Happy Easter! Love the vintage pail. Is all that chocolate for me? I have a bunch of those silver pails, too! Love what you did--the colors are fabulous and perfect for spring. Now that is my kind of Easter Basket! Love it! Happy Easter, Lisa! your talent and/or ideas from, but I love this bucket. The colors look awesome together and you've used products I didn't know exist and have no clue where to get them. I guess I need to do some shopping! Thanks for sharing!